MyMove.com, the resource for stress-free moving, reached out to moving companies across the country, both those that operate nationally and locally, to see whose green practices stood out. 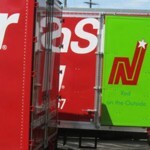 NorthStar Moving was selected as one of the top seven in the entire country leading the way in eco-friendly moving for its commitment to their green efforts in their moving services as well as through their community outreach. 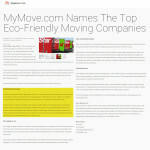 MyMove.com names NorthStar Moving Company as one of the Top Eco-friendly Moving Companies.